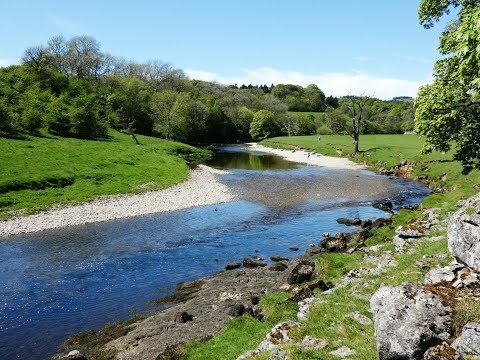 The River Wharfe for its first 15 miles heads east from its source the confluence of Oughtershaw Beck and Green Field Beck near Beckermonds in Langstrothdale. It then heads south, into Wharfedale, and south eastwards for a further 45 miles before it enters the River Ouse at Wharfe’s Mouth near Cawood. The section from the river’s source to Addingham below Grassington and Threshfield is known as Upper Wharfedale and lies in North Yorkshire and in the Yorkshire Dales National Park. Below Addingham where the dale broadens and turns eastwards this section is shared between North Yorkshire and West Yorkshire which includes the towns of Ilkley, Otley and Wetherby and is known as Lower Wharfedale. The river flows through many gills and over the waterfalls of Scar Lash near Conistone, Linton Falls near Grassington and the Strid at Bolton Abbey it is also a public navigation from the weir at Tadcaster to its junction with the River Ouse and tidal from Ulleskelf. The River Wharfe is outstanding for Fly fishing with good stocks of wild brown trout and some grayling. Grass Wood Nature Reserve, an ancient woodland of about 220 acres, is one of the largest areas of broadleaved woodland in the Yorkshire Dales. It has an exceptional ground flora of woodland flowers and became a Site of Special Scientific Interest in 1955 for its upland broadleaved woodland and is also listed in A Nature Conservation Review. Managed by the Yorkshire Wildlife Trust the wood is situated on the west and south facing slopes of a bench of Carboniferous limestone therefore the woodland grows out of limestone scars, limestone pavement and scree. Beech, sycamore, spruce, larch and pine were planted into the woodland in the 20th century and are now gradually being removed to restore the wood to its natural canopy composition of ash, wych elm, oak and hazel. In the 1960’s the Trust leased a small portion of the wood from the Forestry Commission and over the years they became more involved finally completing the purchase of the whole wood in 1983. Managed as a nature reserve it has since been supported by an enthusiastic team of volunteers. The best time to see all the wonderful species of ground flora in Grass Wood is in late March to early June and like Lower Grass Wood it is a good place to see and hear woodland birds and butterflies. Small groups of roe deer can also be seen in the quieter parts of the wood. From the car park we make our way through the little gate at the bottom left hand corner and follow the walled path down to the footbridge over Linton Falls on the River Wharfe. We do not cross the bridge but turn right and follow the riverside path to the road bridge. We cross straight over then turn left and continue to follow the riverside path which passes through Lower Grass Wood to a minor road. We turn left and follow the road and after a short way we turn right at the footpath sign through a gate into Grass Wood Nature Reserve. We head forward uphill through the wood then at the y-junction we turn right uphill taking the track via Park Stile. We pass an Iron Age settlement and soon come to the edge of the wood and pass over a stile in to a field. We cross the field to go through the gap in the wall to the right of a stone barn. We then head to the right hand corner of the next field to pick up a track which takes us past two more stone barns. When the track bends round to the right we head forward over the stile into another field. We head uphill bearing right until we reach a gated stile. We cross the stile and almost immediately we cross another stile. We head forward over the field and turn right at the footpath sign. We head straight forward over the field with a farm on the right to the next gate. After passing through the gate we turn right and follow the track to a narrow road. We turn left and follow the road to the junction then turn right downhill into Grassington village. At the main road we turn left back to the car park. This is an easy walk on grass paths and gravel tracks. There are some gates and stiles and some gentle inclines and declines. Elevation: approx lowest point 161.60m (530.18ft) approx highest point 279.10m (915.68ft) approx ascent 277.20m (909.45ft). Approx 5 miles allow 2 hours using OS Explorer Map OL2, Yorkshire Dales, Southern and Western areas. This walk is anti clockwise. Start point: Grassington Pay and Display cark. Charges are £4.50 for all day. Grassington is in the valley of Wharfedale in the Yorkshire Dales. There are public toilets situated next to the Tourist Information Centre in Grassington car park. For refreshments there are three pubs, cafes, tea rooms, a fish and chip shop and many shops to browse around Grassington market place.